Play Drive: Multiplier Mayhem Touch® for real! Get ready for one of the fastest mobile slot games developed by NetEnt as Drive: Multiplier Mayhem Touch® is all about street racing. 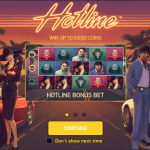 The moment you open this mobile slot game on either your mobile phone or tablet, you will be captivated by high-quality animations which, in my opinion, look a lot like those in the Thief™ slot. This time, though, there’s no female thief involved although another fearless woman is introduced as you’re about to meet Jette who seems to have no fear for fast cars or dodgy opponents. 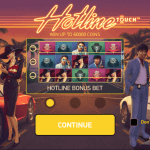 Bringing the exact same excitement as its desktop version, Drive: Multiplier Mayhem Touch® is not going to disappoint in terms of design and slot features. I promise there won’t be a dull moment when you choose to play Drive: Multiplier Mayhem Touch® and it probably all starts with a bunch of Wild Multipliers followed by a Free Spins feature in which Jette is up racing against three racing rivals which will keep the adrenaline rushing throughout all four levels. Play Drive: Multiplier Mayhem Touch® and NetEnt will bring you to the future where you’ll be part of a racing experience as never seen before in an online slot. Goosebumps will become part of the slot experience as soon as you hear the sound of fast cars combined with epic back ground sounds. Better be stress resistant when playing Drive: Multiplier Mayhem Touch® as this mobile slot experience might result in an adrenaline rush. Sign up for some real action as Jette is about to beat Twitch, Hamaki, and Bruiser, her three dodgy looking opponents. 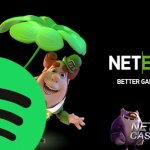 NetEnt’s innovation will bring you a mix of high-quality animations and a great gameplay including very enjoyable slot features. Get ready for new slot features, seen for the first time in Drive: Multiplier Mayhem Touch® such as Nitro symbols and a Nitro Collect Meter. There’s a lot to look forward to when you visit one of the many mobile casino platforms linked to the NetEnt Casinos. Over 40 mobile slot games have been developed by NetEnt and it was in February 2016 Drive: Multiplier Mayhem Touch® was added as well bringing a Free Spins feature to another level with four levels and three opponents to beat to the finish line. Except for the Multiplier Wild, all slot features in this mobile slot game are linked to each other bringing a truly exciting mobile slot experience. As far as I know, Drive: Multiplier Mayhem Touch® is the first mobile slot game that is going to bring a Free Spins feature in which you’re about to beat three opponents in four different levels. To get to the action, three Scatter symbols have to appear anywhere on reels 2, 3 and 4 so 10 Free Spins will be activated. You can expect a rather advanced slot features as several different slot features make one. 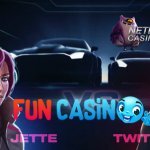 First of all, you receive 10 Free Spins after which Jette will initially race against Twitch. Additional Free Spins will be awarded when three Nitro symbols appear anywhere one the three middle reels. Besides Free Spins, Overlay Multiplier Wilds will be awarded as well bringing extra excitement and bigger winnings. The Nitro symbols you’ve collected are stacked in the Nitro Collect Meter every three Nitro symbols, the game moves to the next level which means Jette will race against another opponent. Keep collecting enough Nitro symbols during Free Spins and you’ll see another street race and it seems Bruiser is the last and toughest one to beat. While you wait for Free Spins to be activated and the street races to begin, Multiplier Wild symbols will keep you captivated during the main game. These Multiplier Wilds can appear on all reels where they will act as a Wild, substituting for any other symbol in Drive: Multiplier Mayhem Touch®. Except Scatter symbols and Nitro symbols, though, as they both have their own role to play in this mobile slot game. Multiplier Wilds have the same multiplier as the reel the Wild Multiplier have landed on. If two or more Multiplier Wild symbols appear on one active bet line, the corresponding multipliers are multiplied. For example, if there are two Multiplier Wild symbols on one winning bet line on reel 2 (x2) and reel 4 (x4) this means your winnings will be multiplied by x8. 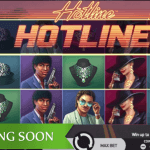 This way a bet line Multiplier can reach a massive 120 X bet which I haven’t seen before in any online slot. Looking for an energetic slot game at one of the NetEnt Casinos which can be played on your mobile phone or tablet, you have found yourself a winner. This speedy car slot game provides an extraordinary experience with Jette racing to reach the finish line to beat her three rather dodgy rivals. Drive: Multiplier Mayhem Touch® keeps the adrenaline high with a bet line Multiplier that can reach a massive 120 X bet! So meet Jette and watch her being fearless in the virtual streets of your preferred mobile casino.